A guide to meters, pay stations, parking lots, taxis, bicycle parking, the St. Augustine shuttle service, and when you can park for free. St. Augustine pay stations and parking with the app costs $2.50 per hour, or residents can pay $.50 per hour with a ParkNow Card or if they’ve signed up with the ParkStAug App as a resident. There is a three-hour parking limit on city streets, in city lots, there is a four-hour limit. Pay stations are located throughout the city; some are city-owned, and others are privately owned. The city-owned pay stations are marked with the city crest. Additionally, the Historic Downtown Parking Facility can accommodate 1,200 vehicles and costs $15, or $3 with a ParkNow Card. The City of St. Augustine provides a free shuttle service for residents and visitors during the busiest times of the year. Those times are usually during the holidays, major events like festivals, and other special weekends. Check out our Shuttle Page. It will tell you everything you need to know about the shuttle service and the next time it will operate. If you’re only visiting St. Augustine for the day, you can still use credit cards, debit cards, bills, and coins at pay meters and pay stations. However, we suggest downloading the ParkStAug App if you are here for an extended stay or visit St. Augustine often. The app makes parking downtown a bayfront breeze. It’s available throughout the city limits of St. Augustine except for at the Historic Downtown Parking Facility. You can download the app on IOS and Android and set up your account by adding your payment method (credit or debit card) and your license plate number. You can also set up your account online at ParkStAug.com. Once you find a parking spot in town, open the app and select your zone. As seen in image 2, zones can be easily identified on signage in the area such as on the side of a pay station. Next, enter the amount of time you’ll be parked there. The best part of the parking app is that users don’t have to run back to “feed the meter”. If you want to stay longer, simply open the app and add extra time. Residents will also have to enter their driver’s license and vehicle registration for the Resident Discount. Additionally, ParkNow Cards can still be used for the time being but will eventually be phased out and replaced with the app. For more questions about the ParkNow Card please visit ParkStAug.com or call the city’s Parking Division at (904) 825-1090, Monday through Friday between 8:00 am and 5:00 pm. There is one public electric car charger in the city of St. Augustine which is located at the east end of DeSoto Pl. Although people must pay for parking while their vehicle is there during enforcement hours, the charger is free to use and open to the public. It is a ChargePoint CT4000 which can charge up to 25 miles of range per hour as well as fully charge some vehicles in less than four hours. Image 1: You may purchase a parking ticket at a pay station with a credit card, debit card, or cash; St. Johns County residents can use their ParkNow Card. Image 2: Zones can be identified on the side of a pay station. One of the largest lots in St. Augustine is the Castillo de San Marcos lot. One-quarter mile south of the Bridge of Lions, there is a pay station located on Avenida Menendez on the opposite side of the bayfront. A pay station lot is located behind the Lightner Museum. There is street parking on the streets of Granada and Cedar. Street parking is available on the parts of King Street and Cathedral Place that parallel to the Plaza de la Constitucion. On the corner of Charlotte Street and Treasury Street, there is a pay station lot. Grace Lot is on Charlotte Street next to restaurant La Pentola. In between streets Hyptolia and Cuna is Toques Place Lot. Historic Downtown Parking Facility is located at 1 Cordova St, St Augustine, FL 32084. One-quarter mile south of the Bridge of Lions, there are meters on the bayfront side of Avenida Menendez. There are 16 individual meters on Valencia Street, near Flagler College. On Sundays and national holidays, meters and pay stations marked by the city crest are free. Monday through Saturday, city-marked meters and pay stations are free before 8:00 am and after 5:00 pm – parking is free before 10:00 am and after 5:00 pm around the Plaza de la Constitucion (Cathedral Pl. and King St). You must have the proper car tag to park in an area marked as residential. Before 7:00 am and after 7:00 pm you may park here free of charge and do not need a tag. There are several handicap accessible parking spaces in Historic Downtown. Use the map below to find the parking space most convenient for you! Florida State Statutes state that persons with a valid handicap license plate or placard may park for free on all public roadways. This includes city-owned parking lots and meters, the Historic Downtown Parking Facility, and the Castillo de San Marcos parking lot. There is no time limit for how long your vehicle may be parked there. But, the St. Augustine City Code states vehicles must be moved every 48 hours on public roadways. Calling a local taxi or Uber during Nights of Lights is ideal for a number of reasons. Instead of driving in circles for a parking place, a taxi can conveniently drop you off at your destination. You also pay a flat fee with a cab and don’t have to worry about feeding the meter or watching the clock. Most importantly, Nights of Lights is a time to celebrate the holidays! While enjoying St. Augustine’s light display you may want to share a bottle of wine over a romantic dinner or join a pub-crawl tour. Driving your vehicle limits activity options, and if you are parked in a meter or pay station area, it also limits the amount of time you have. Taxis, Uber, and Lyft exist in St. Augustine. Open weekdays until 10 pm, weekends 24 hours. 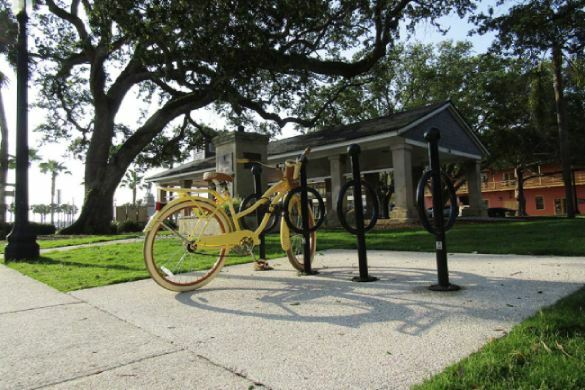 St. Augustine is proud to be a bicycle-friendly city. Several bike stations are located along the bayfront, north, and south of the Bridge of Lions. At the Visitor Information Center, when you enter from San Marco Ave.
At the southeast corner of the Historic Downtown Parking Facility. At the corner of Orange Street and St. George Street. Inside of the Toques Place Lot. Across from Lewis Auditorium on Granada Street.